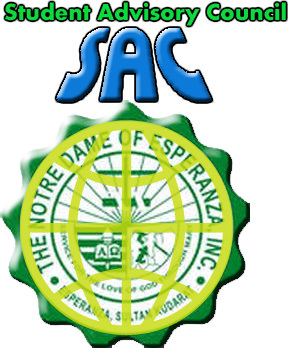 The Student Advisory Council, or SAC, is the group of students that is officially charged with representing the needs of the students to the decision-makers in the The Notre Dame of Esperanza Inc. The abbeviation S.A.C. mean "Student Advisory Council", they are the leaders whom lead our fellow Notre Dameans for a better place and future in NDEi.They sincerely swore to do their best and exhaust more effort for the welfare of the studentry and for their beloved Alma Mater.